Oh my gosh! 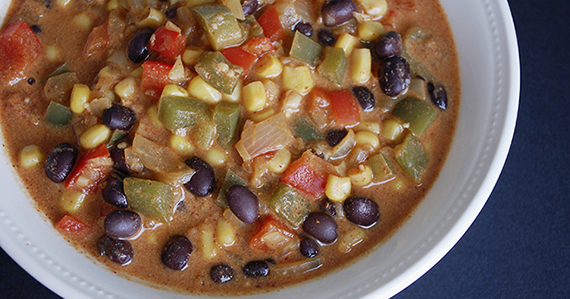 I made Mexican Chowder from Lindsay Nixon’s Everyday Happy Herbivore cookbook. It is amazing-hot or cold! So cheesy-like, thick and great. TIPS: As you know, Happy Herbivore cookbooks are my go-to favorites. I usually have what I need in my pantry, and if I don’t, I can just substitute. Like I always say, “Use what you have.” For example, I doubled this recipe and did not have two green peppers, so I threw in two packages of sliced mushrooms that I was getting antsy about going bad in my fridge. I also only had brown miso, not the yellow type called for. This dish turned out fantastic. Also, I only use organic corn due to all other corn being GMO–same with soy (and NEVER soy protein isolate). I always portion out the servings into separate bowls and refrigerate the extras for the next day’s meal. That way, I don’t overeat. Line a large pot with a thin layer of water and bring to a boil. Add onion and garlic and sauté until onion becomes translucent, about 2 minutes. Add bell peppers and spices and reduce heat to medium, continuing to cook. Meanwhile, whisk 1⁄4 cup of nutritional yeast with nondairy milk and ketchup, then pour over bell peppers, stirring to combine everything. Add miso, corn, and black beans and stir in. Squeeze the juice out of a lime wedge and stir. Taste, adding more lime as desired plus salt and pepper to taste. For a stronger cheese flavor, whisk in 1 to 2 more tablespoons of nutritional yeast. Serve with corn chips. You can garnish with sliced green onion or chopped cilantro, if desired. Chef’s Note: If your liquid is too thin, add tomato sauce, broth, or more nondairy milk.